An assortment of model "safe" homes shaped like soccer balls are on display at a home exhibition in suburban Gifu. 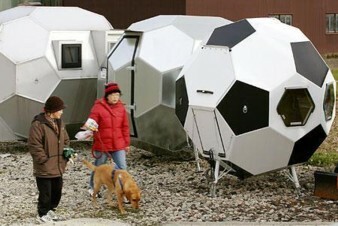 The homes -- named "Barier" by manufacturer Kimidori Kenchiku -- are 32-sided polyhedrons encased in stainless steel. According to the company website, Barier's bulletproof construction is resistant to earthquake, typhoon, fire, and terrorist attack, and its ability to float in water makes it floodproof. When buried underground, Barier can be used as a tornado or bomb shelter. The price tag includes a mini-kitchen, a bed and two 15-inch LCD TVs, so you can be sure to catch all the World Cup action no matter what transpires outside. 215 685-6373. THANKYOU. Again my name is Carter Stone. I am interested in finding out more about these soccer houses. I would like to know the cost, how to build one, etc. I would love to have one in my backyard. It's the perfect size for my kids and for a soccer crazy family line mine.